Pumpkin Cardamom Souffle | Have YOU Ben Starr Struck? Souffles are one of those things you see on cooking shows and MAYBE you’ll make one or two throughout the course of your life. I’m not sure why this is the case. Perhaps it’s because there is an old myth in the kitchen that souffles are temperamental and impossible to get right. This is malarkey! Souffles are incredibly easy. Your kids can make them. And they’re not really that bad for you. This recipe contains only egg whites, which are pure protein, a small amount of sugar, and are 90% air but exploding with flavor. They’re gluten-free too! And, of course, you can count on me to give you a pumpkin version! 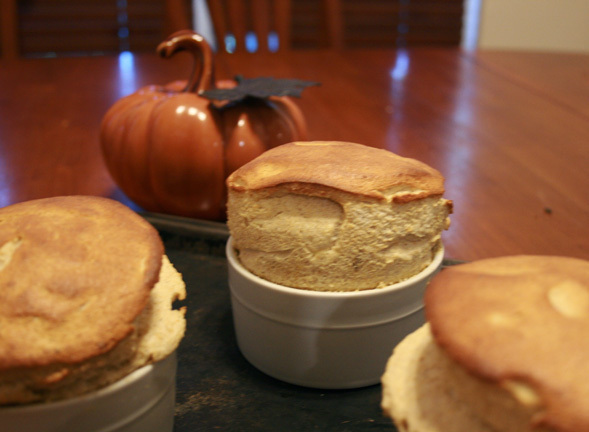 This souffle combines two of my favorite flavors: pumpkin and cardamom. The final texture is incredibly light and airy, and it works well for both breakfast and dessert. 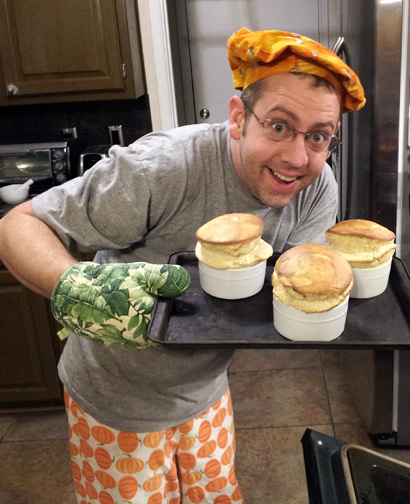 Souffles are way more versatile in terms of cooking time than you may realize. You can make the base and keep it in the fridge for several days. When you’re ready to bake, beat the whites, fold them in, and bake em! You can also prepare the entire souffle batter, including folding in the whites, place them in the ramekins, and stick em in the fridge. Then, 20 minutes before dessert, preheat your oven and bake em. They won’t rise QUITE as high if they’ve been sitting in the fridge all day, but they’ll still rise beautifully…about 80% of the fresh-batter rise. Butter 4 single-serving ramekins thoroughly. Then sprinkle them with sugar and move the ramekin around to get the sugar coated on all sides and the bottom. Then put them in the fridge. Scrape the base into a large bowl and let it sit on the counter or in the fridge to cool while you proceed. Beat at medium speed until it begins to get fluffy, then increase the speed. You want to take the whites to stiff peaks, which is when they become thick and glossy and begin to fluff up around the beater. Stop and check often if you’re not accustomed to doing this. One of the only ways to ruin a souffle is to take the whites PAST stiff peaks, to the point where they become chunky and start to leak water. Pull the beater out of the whites and if it leaves a stiff little peak that won’t slump downwards when you turn it right-side up, you’ve got stiff peaks. It’s better to be just UNDER stiff peaks than just BEYOND stiff peaks. If the whites separate into clumps or chunks when you rake the beater through them, you’ve gone past stiff peaks. Adding all the sugar at the beginning of the beating time reduces the chance that you will over-beat the whites. Place the ramekins onto a baking sheet and bake them on the center rack of a preheated 400F oven for about 15 minutes. These souffles rise VERY high and brown nicely on top. If you like your souffle very dry, almost like a meringue, you can continue baking it through 20 minutes. If you like your souffle custardy and moist in the center, you can take them out at about 12 minutes. 15 minutes gives you a still moist but totally set souffle. These souffles will stay puffed for a good 5-6 minutes after removing them from the oven. But serve them as quickly as you can. I like to serve these with real maple syrup, whether they are breakfast or dessert. Due to the large amount of cardamom in the recipe (which is what makes these SO delicious), the souffle has a slightly “floury” texture from all the grains of cardamom, and the maple syrup prevents that from being noticeable. This entry was posted in Breakfast, Desserts, Recipes, Vegetarian and tagged Ben Star, Ben Starr, cardamom, eggs, gluten free, Gordon, MasterChef, pumpkin, Ramsay, Ramsey, souffle. Bookmark the permalink. Hi ben! these look perfect for my thanksgiving this year. I am wanting to get some ramekins but am wondering what size you used in your recipe? 🙂 thanks! Jess, these are 8 ounce ramekins, but you can use any size!